Thoughts from an Email sent October 1st 2008. News Headlines in "The Australian"
Central banks worldwide struggle to stop the credit crisis from triggering a global downturn. Monday's shock defeat of the US Government's $US700 billion Wall Street bailout sent stock markets into meltdown. In New York, the Dow Jones industrial average suffered its biggest points fall - a 777 point rout that wiped more than $US1 trillion from the value of listed stocks - after a bitterly divided US House of Representatives blocked the emergency bailout. As the day began in Australia, it was still September 30th, Rosh Hashanah 5769, New Year's Day in Israel. Click here to confirm this on a Hebrew Date Converter page. Click here to see a list of Jewish holidays in the calendar year January - December 2008. Jewish New Year's Day, Rosh Hashanah, in 2007 had been the start of a seventh or sabbath year for all devout Jews. 2007-2008 AD was in fact the 496th seventh year, counting 1459-1458 BC as the 1st — after Joshua in 1465 BC led them into the land of Israel. Click here for this timeline. Note that the 50th year, the first year following the 7th Sabbath, was always to be a Jubilee year when the trumpet would be especially blown (see Leviticus 25). It was a "Freedom" year for the agricultural land, and a year when every man would be allowed to reclaim their land title, based on his genealogy through his father. Interestingly according to Acts 13:20-21, David's ascent to the throne in 975-974BC came in the 10th Jubilee year that followed 490 years (70 times seven) years of forgiveness from the Lord. And most interestingly, the six day war in June 1967 when Israel reclaimed all of Jerusalem came in the 70th Jubilee year that followed 3430 years (70 times seven times seven years) of forgiveness from the Lord. Click here for a list of these 70 Jubilee Years. So, in the first instance, we see in 975-974 BC God's chosen king, David revealed. In the first instance according to 2 Chronicles 3:2, we see in the 4th year of his reign in 932-931 BC, the commencement of God's temple on earth. A seven year contract. In the second instance, did we see in March 2010 AD, the commencement of a separation of the US Govt from Jerusalem on earth. From the viewpoint of a rebellious world, the start of a great divorce. Certainly the meeting in Copenhagen in Dec 2009 spoke of the fear, worldwide, of what people see coming upon the earth click here. Yep, really enjoying the sense of the Lord's hand over all that's happening at the moment. Note - the "underlined" words link to the original Greek - the "others" are just fill in words to flesh out the meaning in King James's era :-). i.e. "rulers of the darkness of this world" in Ephesians 6.
Who then is a faithful and wise servant, whom his lord has made ruler over his household, to give them meat in due season ? And shall cut him in two and appoint him his portion with the hypocrites: there shall be weeping and grating of teeth. Silver is the word in Scripture that is translated as money — it had been generally used for thousands of years because of its inbuilt value. Imbalances in international trade were theoretically rectified automatically by the gold standard. A country with a deficit (i.e. the country spending more in imports than it was selling in exports) would have depleted gold reserves and would thus have to reduce its money supply (the paper it was authorizing the banks to trade with). The resulting fall in demand would reduce imports and the lowering of prices (for individuals to stay in business) would boost exports; thus the deficit would be rectified. Any country experiencing inflation would lose gold (people would change their paper money back to gold to protect themselves from the reducing value of the paper) and therefore would have a decrease in the amount of money (paper) available to spend. This decrease in the amount of money would act to reduce the inflationary pressure. Supplementing the use of gold in this period was the British pound. Based on the dominant British economy, the pound became a reserve, transaction, and intervention currency. But the pound was not up to the challenge of serving as the primary world currency, given the weakness of the British economy after the Second World War. The architects of Bretton Woods had conceived of a system wherein exchange rate stability was a prime goal. Yet, in an era of more activist economic policy, governments did not seriously consider permanently fixed rates on the model of the classical gold standard of the nineteenth century. Gold production was not even sufficient to meet the demands of growing international trade and investment. And a sizeable share of the world's known gold reserves were rumoured to be in the Soviet Union, which would later emerge as a Cold War rival to the United States and Western Europe. The only currency strong enough to meet the rising demands for international liquidity was the U.S. dollar. The strength of the U.S. economy, the fixed relationship of the dollar to gold ($35 an ounce), and the commitment of the U.S. government to convert dollars into gold at that price made the dollar as good as gold. In fact (just as the British pound had done previously), the dollar was even better than gold: it earned interest and it was more flexible than gold. There is a lot more in the article, but that's the section I particularly enjoyed because of how well it summarized the issues. Of course, the 1944 agreement which brought in the IMF and the World Bank, then the U.S. grants through the Marshall Plan, led to a sense of real competitive anger at America — being seen to be at the top — and then Israel coming in to being. And it is certainly natural for everyone to be grasping for more i.e. covetous, or greedy, what the Scripture calls idolatry i.e. worshipping/serving visible object(s). So, no, it couldn't last. And so by 1971, the US's gold stock was insufficient to meet the swelling official demand — with this growing shortage of gold America had to devalue the dollar (also rapidly), and thus came off a fixed gold standard — and since then the standard backing of currencies is simply by "fiat" i.e. what governments/business markets in groups, and individually decree — based on their forecast of future incomes. Frequently driven by fear. Click here for a list by Allianz of currency/stock/bonds owned by each country's residents — America currently showing €35 trillion. Click here for each country's gross external debt i.e. owed to non-residents — with investment in America click here currently showing $15 trillion. Click here for each country's foreign exchange reserves — America currently showing $150 billion. And click here for each country's official gold reserves — with 8133 tonnes, America currently valued at $450 billion. Currently, about 85% of all currency transactions across the world involve the US dollar click here. Comment from a friend "Note: The US not only holds the most gold but it represents 75% of their reserves. This means that whilst their dollar may not be backed by gold, they still understand its role as a potential storage of wealth in tough times. So, the US financial system is being hammered but as a country, any run on the gold price will help them (i.e. the federal reserve) to buy out the toxic debt and restabilise things. Look at the UK. Backs to a wall and no gold to play with...ouch." And another friend's prayerful thought: "I think there are two currencies operating in the world: a) the currency of greed and corruption orchestrated by the world's international monetary system, and b) the currency of God's love revealed in Christ and extending Eternal Life to all who respond in faith to God's Call. I think this second currency operates 'under the radar' a lot of the time even though the world system tries to annex it through the institutionalisation of religion. But the Word of God grows and multiplies — Acts 12:24 — and wherever it grows and multiplies it brings blessing and peace and stability, in a measure, to the nations that do not actively war against it. Those that oppose it struggle massively with social degradation and economic impoverishment. I believe the uncharacteristic blessing that abides on Australia has come about because godly men and women have faithfully preached the Word over the time of our brief history. 'In Him was Life; and the Life was the Light of men. And the Light shineth in the darkness; and the darkness comprehended it not' John 1:4,5 "
Further thoughts: Page 34 of Weekend Australian Oct 11-12, 2008 "China will continue to buy massive amounts of foreign — especially US — treasury bills. This will underline the growing dependence of the world on Chinese — and to an extent also Indian — commitments to resolving any global challenge." Yes, I suppose their investment in those treasury bills makes them a major player — if not the major player. Except for where the Lord sovereignly plays a hand. :-) Massive game of poker going on at present. Click here for some background on over-the-counter derivatives, published in Weekend Australian on October 18, 2008. The US Federal Reserve has purchased more than $1.7 trillion in Treasury and mortgage debt, taking these complex derivatives as collateral for the loans, partnering with the government to rescue companies such as American International Group Inc. and Citigroup Inc. The Bank of England essentially printed money when it bought swaths of government bonds. The European Central Bank, the Bank of Japan and others took similar steps. Click here for a report on February 11th, 2010 comparing the surging Australian economy with other economies. Click here for recent news on the situation in Europe since May 4th 2010 & the IMF's bailout of Greece. Brief Quote "The Greek bailout means Euro-area nations are indeed their brothers' keepers, which in practice means every country's debt is on every other country's balance sheet." NEW YORK: Protesters have torched cars and smashed up banks in Rome, while clashes involving police on horseback erupted in New York's Times Square on a day of worldwide demonstrations against corporate greed and government cutbacks. Tens of thousands took to the streets of the Italian capital for a march that turned violent, and equal numbers rallied in Madrid and Lisbon. In New York, where thousands protested, more than 70 were arrested yesterday. The protests — which included rallies in Adelaide, Brisbane, Melbourne and Sydney and Wellington and Christchurch in New Zealand — were inspired by the Occupy Wall Street movement in the US and the Indignants in Spain, which are targeting 951 cities in more than 80 countries. It was the biggest show of power yet by a movement born on May 15 when a rally in Madrid's central Puerta del Sol square sparked a worldwide campaign focused on anger over unemployment and corporate greed. "It is very moving that the movement that was born here has extended throughout the world. It was about time for people to rise up," said Carmen Martin, 24, as she marched towards Puerta del Sol. In Rome, which saw the worst violence of the weekend, the march quickly degenerated into running street battles between groups of hooded protesters and riot police who fired teargas and water jets into the crowd. Italian Prime Minister Silvio Berlusconi condemned the "incredible level of violence" at the march, which took place amid a security lockdown. "We've seen the worst of Europe today in Rome," Mayor Gianni Alemanno said. At least 70 people were injured in the clashes and treated by medics, including three who were in a serious condition, Italian news agency ANSA reported. Backing from Italy's main trade unions and student movements boosted the numbers at the protest in Rome, in contrast to most of the other rallies. The protests received unexpected support from Italian central bank governor Mario Draghi, a former executive at Wall Street giant Goldman Sachs who is set to take over as president of the European Central Bank. "They're angry against the world of finance; I understand them," Mr Draghi said, while expressing regret at the violence. In the Portuguese capital, where about 50,000 protesters rallied, Mathieu Rego, 25, said: "We are victims of financial speculation and this austerity program is going to ruin us. We have to change this rotten system." 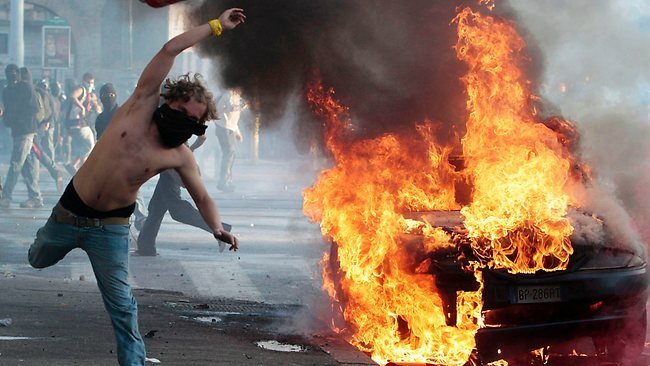 Protests were staged throughout Europe in Amsterdam, Athens, Brussels, Geneva, Paris, Sarajevo and Zurich. Thousands also rallied across Canada and in New York, Washington and Miami. More than 10,000 Canadians blew bubbles, strummed guitars and chanted anti-corporate slogans at peaceful protests in cities across the country. In Mexico, Peru and Chile, thousands marched to protest against what they slammed as an unfair financial system and stagnant unemployment. About 500 people gathered in the heart of Hong Kong's financial district to vent their anger, and in Tokyo a crowd of about 100 demonstrators voiced their fury at the Fukushima nuclear accident. Scuffles broke out in London, where about 800 people gathered in the financial district by St Paul's Cathedral. Five people were arrested, three for assaulting police officers and two for public order offences, Scotland Yard said. Three lines of police, and one line at the rear on horseback, blocked protesters from heading to the London Stock Exchange and pushed back against lead marchers, some wearing masks. "One of the reasons why we support what is happening here in Occupy London is because the banking system in London is the recipient of corrupt money," Australian WikiLeaks founder Julian Assange said from the steps of St Paul's, flanked by bodyguards. The European Union also became a target for anger as the eurozone debt crisis continues, with about 9000 protesters marching to the EU's headquarters in Brussels and rallying outside the ECB's headquarters in Frankfurt. In the US, at least 74 protesters were arrested as thousands marched in New York. Police on horseback clashed with demonstrators in Times Square, and one woman was injured. At least 2000 marched in Washington, while in Miami, a city that rarely hosts mass demonstrations, at least 1000 people marched downtown to vent their anger against corporations, banks and war. THE tentacles of Europe's debt crisis are clutching at the heart of the Australian economy with global credit markets frozen in a "Lehman-style way", triggering warnings from the nation's most senior bankers that a new financial crisis is upon us. "This is fundamentally a European problem and the issue is there is a contagion," ANZ chief executive Mike Smith said yesterday. "There is a credit crunch in Europe now, it is spreading to Asia and it will spread here too." The primary market and the European interbank markets have "basically come to a stage where there is just no movement", he said. "The interbank market in the US is still open but it is very, very short. But the issue really is that it doesn't matter who you are (in the primary market) there is no bid," he said, identifying the failure of the German bond auction as a pivotal demonstration of the timorous state of investor confidence. "If the German government can't raise money, then no one else can," he said. "The problem is that nobody is prepared to invest. A senior commercial banker said yesterday that, like the 2008 crisis when Lehman Brothers collapsed, "funding markets have frozen again right now in a post-Lehman style". The direction that is being given by the political classes and the regulators to the European banks is that they have to increase their capital. Their response to that has been to deleverage rather than to raise new capital and thus one of the world's key sources of debt and trade finance has quite suddenly run dry of confidence and capital. The implications of this potentially secular (generational) shift in the European banking system and the credit markets it has traditionally supported could be seismic around the globe and across an extraordinarily diverse front of global commerce and trade. And this time around, China's need to feed its prosperity might not protect Australia from global financial infection. Then said he also to him that bade him, When you make a dinner or a supper, call not your friends, nor your family, neither your relatives, nor your rich neighbours; lest they also bid you again and a repayment be made to you. And you shall be blessed; for they cannot repay you: for you shall be repaid at the resurrection of the just. And sent his servant at supper time to say to them that were bidden Come for all things are now ready. So that servant came and showed his lord these things. Then the master of the house being angry said to his servant, Go out quickly into the streets and lanes of the city, and bring in here the poor, and the maimed, and the crippled, and the blind. And the servant said Lord, it is done as you have commanded and yet there is room. If any man come to me, and hate not his father, and mother, and wife, and children, and brothers, and sisters, yea, and his own life also, he can not be my disciple. Note that in Ephesians 5:28-29, husbands are commanded to love their wives as their own bodies. So ought men to love their wives as their own bodies. He that loves his wife loves himself. There is no contradiction — what we are looking at here is a contrast of preferences — to receive the power "dunamis" to be a disciple / learner, Christ must come first, because Christ first loved / valued us. And whosoever does not bear his cross, and come after me, can not be my disciple. For which of you, intending to build a tower, sits not down first, and counts the cost, whether he have sufficient to finish it? Or what king, going to make war against another king, sits not down first, and consults whether he be able with ten thousand to meet him that comes against him with twenty thousand ? Or else, while the other is yet a great way off, he sends an embassy, and desires conditions of peace. So likewise, whosoever he be of you that forsakes not all that he has , he can not be my disciple. They did eat they drank they married wives they were given in marriage until the day that Noah entered into the ark, and the flood came and destroyed them all. Likewise also as it was in the days of Lot; they did eat they drank they bought they sold they planted they built. But the same day that Lot went out of Sodom it rained fire and sulphur from heaven, and destroyed them all. In that day, he which shall be upon the roof, and his stuff in the house, let him not come down to take it away and he that is in the field, let him likewise not return back. Who opposes and exalts himself above all that is called God, or that is worshipped; so that he as God sits in the temple of God, showing himself that he is God. Remember you not, that, when I was yet with you, I told you these things ? And now you know what withholds (holds him fast) that he (i.e. the man of sin) might be revealed (uncovered) in his time. For the mystery of iniquity does already work only that who now lets (holds him fast) will let, until that be taken out of the way. Yesterday afternoon I found myself popping together some 'global growth' averaging since 1900, after reading a statistic at midday on how nearly 11 billion people have been born since 1900. Pretty big number alright, for those interested, here are the numbers below, broken into two periods 1900-1959 when we hit 3 billion, and 1959-2012 when we hit 7 billion. History has never seen the like. Lord, you know the hearts (and died for) each one.